This item is 7 years and 11 months old; some content may no longer be current. Extensively hydrolysed formula for infants aged under six months and soy formula for infants aged over six months are the first-line choices for infants with cows’ milk protein allergy, without anaphylaxis, if formula is required. Amino acid formula is the first choice for infants with anaphylaxis due to cows’ milk protein allergy or eosinophilic oesophagitis. Breast feeding is recommended for infants whenever possible and should be encouraged, however, successful management of cows’ milk protein allergy may require elimination of dairy products from the maternal diet. Funding for amino acid formula will only be available to patients who have trialled the extensively hydrolysed formula or who have had anaphylaxis on exposure to cows’ milk, or who have eosinophilic oesophagitis. Reassessment for continued funding, including assessment as to whether the infant can be switched to a less specialised formula will be required every six months instead of every 12 months. Soy formula and elemental formula are the two main products used for infants with cows’ milk protein allergy (CMPA). The two types of elemental formula available are extensively hydrolysed formula and amino acid based formula. In New Zealand, more expensive and last-line amino-acid formula products, e.g. Neocate, are being prescribed as an early option. Pharmaceutical dispensing data indicate that 78% of infants with CMPA are being prescribed an amino acid formula without an initial trial of an extensively hydrolysed formula. The use of amino acid formula as an early option is a concern on two fronts. Firstly, it is out of line with international guidelines which suggest that only approximately 5–10% of infants with CMPA require an amino acid formula.1,2 Secondly, amino acid formula is significantly more expensive than other options (approximately five to six times the cost of extensively hydrolysed formula per 100 mL). The high cost and the high uptake of amino acid formula in New Zealand (the use of elemental formula is approximately 60% higher in New Zealand than in Australia on a per capita basis)3 is causing expenditure growth in the Special Foods therapeutic group. In 2008/09 expenditure on elemental formula was $5.8 million, with approximately 38% annual growth (Figure 1). PHARMAC also considered which of the milk-replacement options should be considered for funding versus which should be considered a private cost. PHARMAC concluded that the more specialised products, such as extensively hydrolysed formula and amino acid formula, should be fully subsidised (with Special Authority) and less specialised products that are available in supermarkets, such as lactose-free and soy formula, should not be funded (and be a private cost). CMPA is an immunologically mediated adverse reaction to cows’ milk protein, with a prevalence of approximately 2% in infants aged under two years.1 Allergic reaction to cows’ milk protein can be IgE or non-IgE mediated, and the spectrum of reactions ranges from immediate anaphylaxis and food allergy reactions to delayed effects such as atopic eczema. Table 1 (below) provides a summary of the various clinical presentations of CMPA, including key differential diagnoses. Immediate and delayed CMPA can be differentiated by the timing of the reaction in relation to the intake of cows’ milk. Immediate reactions, such as anaphylaxis, angioedema, urticaria and vomiting, occur within minutes. In contrast, delayed reactions, such as food protein enteropathy, proctocolitis and eosinophilic oesophagitis, can manifest over hours or days. Some disorders have features of both immediate and delayed reactions, e.g. in eczema caused by CMPA, the pruritic rash can occur within minutes, hours or days. CMPA can also occur in exclusively breastfed infants due to allergens present in breast milk from maternal ingestion of dairy products. The most serious form of immediate reaction is anaphylaxis with respiratory tract involvement and/or hypotension. In infants the features of anaphylaxis are not always apparent and they may present with coughing, wheezing, severe distress, floppiness or collapse. Anaphylaxis due to CMPA is extremely rare in exclusively breastfed infants. CMPA allergy can also present with an acute allergic (non-anaphylactic) reaction with erythema, angioedema, urticaria or vomiting. Infants with CMPA are often allergic to other foods such as eggs and peanuts. Immediate allergic reactions are possible in exclusively breastfed infants. CMPA or allergy to other foods (particularly egg, milk and peanuts) should be considered as a possible cause of eczema in children (that is not responding to appropriate treatment), especially if symptoms are moderate to severe. There are a wide range of gastrointestinal syndromes due to CMPA. CMPA may present with vomiting, chronic diarrhoea, malabsorption and failure to thrive. Multiple food allergies are sometimes involved. As CMPA is not a single, uniform entity, making a clear diagnosis can often be difficult. Many of the symptoms observed in CMPA syndromes are non-specific, e.g. diarrhoea, reflux, constipation and other allergies, and can be caused by other common clinical conditions or allergies. Generally, there is limited evidence for switching formula when infants experience symptoms such as vomiting, spilling, crying, diarrhoea or constipation, unless they are severe or persistent, when further investigation is warranted. There is significant potential for incorrect or over-diagnosis of CMPA, exacerbated by misinformation about the significance of milk and food allergies, targeted marketing of infant formula and a trend for avoidance of cows’ milk products and use of hypoallergenic infant formula. Conversely, under-diagnosis of CMPA may increase the risk of adverse nutritional or behavioural outcomes. A correct diagnosis is critical and this may often require referral for immunological or other investigations such as biopsy or specialist gastrointestinal examination (see below). * Apply clinical judgement – these conditions would often warrant urgent referral. Irrespective of the cause and clinical type of CMPA in an infant, cows’ milk should be removed from the diet and replaced with an elemental or soy based formula. See “Management of anaphylaxis in primary care”, BPJ 18 (Dec, 2008). When eliminating cows’ milk, dietary intake should be assessed for nutritional adequacy of the recommended amounts of protein, calories and micronutrients, such as vitamin D and calcium. This also applies to the maternal diet if cows’ milk avoidance is necessary. There are three types of formula available for CMPA; soy-based formula, extensively hydrolysed formula and amino acid formula. 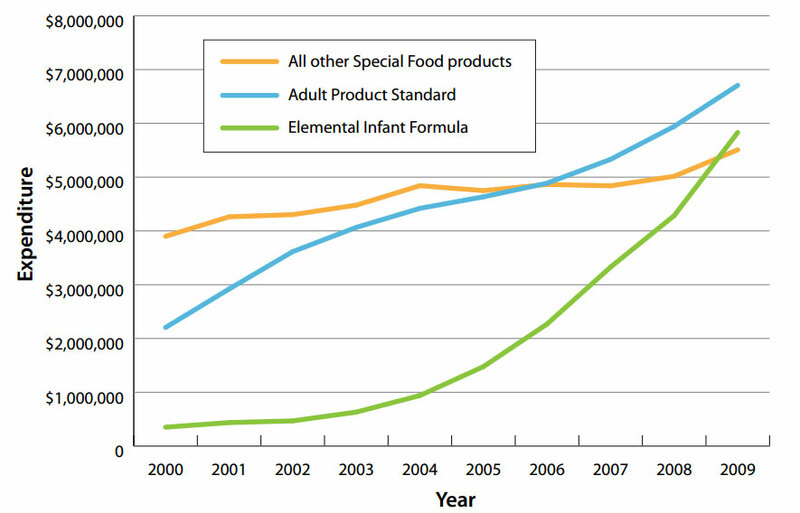 Soy-based infant formula is not appropriate for infants aged under six-months as cross-reactivity or concurrent soy allergy is much higher in this group – 25% under age six months versus only 5% between age 6 – 12 months.2 Some infants aged over six months find soy-based formula more tolerable than extensively hydrolysed formula. Although soy-based formula are not subsidised, these products remain an option for treatment of CMPA in infants aged over six-months and are comparably priced to standard cows’ milk formula. These are the most hypoallergenic formula and should only be considered as first line options for less common, specific types of CMPA or if extensively hydrolysed formula has been trialled and not tolerated. There has been a trend in New Zealand and overseas to prescribe the most hypoallergenic formulas, especially amino acid formula, first line for CMPA.3 This is an expensive option and in most cases not necessary. The type of infant formula most appropriate as the initial option for CMPA should be determined by the age of the infant and the clinical characteristics of the CMPA. Amino acid formula should only be considered as a first line option in infants with CMPA with anaphylaxis and in infants with a confirmed diagnosis of eosinophilic oesophagitis.1,2 In the majority of cases of CMPA, extensively hydrolysed formula, (or soy if the infant is aged more than six months) should be considered first. In some cases failure to thrive affects the choice of formula.1 These recommendations are summarised in Table 2 and form the basis of the current funding pathway. Infants should be reviewed regularly (every six months) to check if tolerance to cows’ milk protein has developed. This can be done by taking a history of accidental ingestion of cows’ milk, skin prick testing, measurement of cows’ milk specific serum IgE or food challenges. In an infant with severe IgE mediated CMPA, tolerance should only be assessed in hospital because of the risk of anaphylaxis. All food groups provide a variety of nutrients. When a whole food group is removed from an individual’s diet there is a risk of an inadequate intake of one or more nutrients. When dairy products are avoided, the nutrients most at risk are protein and calcium. Adequate amounts of energy in a dairy free diet can be obtained by ensuring a varied intake of breads, cereals and carbohydrate-rich vegetables while protein needs can be met by regular consumption of meat, fish, chicken, eggs and meat alternatives (nuts, seeds, legumes and pulses), providing there are no other allergies that indicate such foods should be avoided. In children the adequacy of these nutrients is best assessed by monitoring growth. Consumption of a calcium fortified cow’s milk alternative (soy, extensively hydrolysed formula or amino acid formula) will provide an additional source of calcium. Other dietary sources of calcium should also be encouraged, providing they are age appropriate and the individual does not have a proven allergy to them. There are also no clear guidelines on when an infant with CMPA should be weaned off a formula and when consideration should be given to changing to a less hypoallergenic formula, e.g. amino acid formula, to extensively hydrolysed formula, or extensively hydrolysed formula to soy-based, or for how long the effect of a switch should be evaluated for. However, given that most CMPA syndromes resolve over time, the requirement for on-going formula should be regularly reviewed. Re-assessment should be on a case by case basis and it may be appropriate to consult with a paediatrician or dietitian with expertise in the management of CMPA for further advice. Kemp AS, Hill D, Allen K, et al. Guidelines for the use of infant formulas to treat cows milk protein allergy; An Australian consensus panel opinion. Med J Aust 2008;188(2): 109-112. PHARMAC. Special foods consultation document. PHARMAC, Wellington, 2010. Available from: www.pharmac.govt.nz (Accessed Apr, 2011). National Institute of Allergy and Infectious Diseases Expert Panel. Guidelines for the diagnosis and management of food allergy in the United States. December 2010. Available from: www.niaid.nih.gov/topics/foodAllergy/clinical/pages/default.aspx (Accessed Apr, 2011). This article is 7 years and 11 months old.